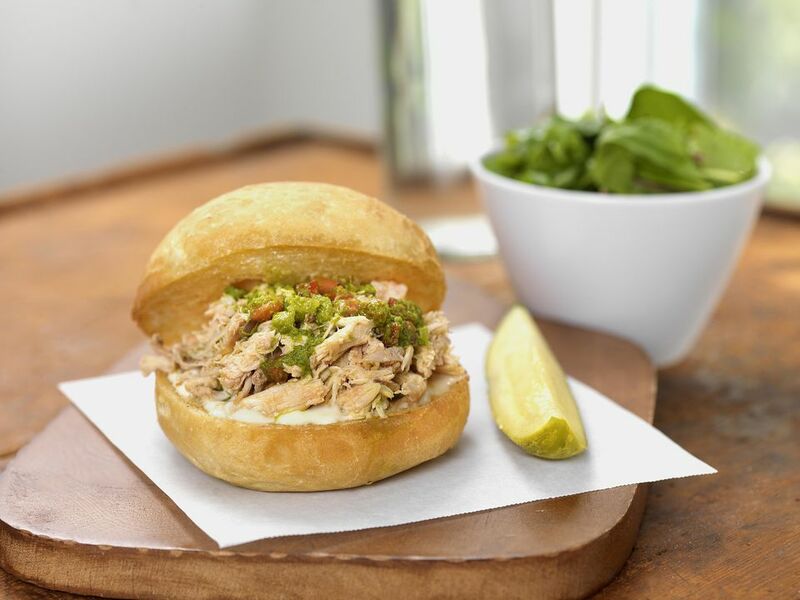 This is a flavorful and spicy pulled chicken sandwich. You can add more or less hot sauce depending on how you like it. This dish is perfect for any weeknight meal, informal gathering, or game day events. 1. Wash and pat dry chicken. Coat outside and cavity of chicken with cayenne pepper, allspice, salt, and black pepper. Place onions, garlic, and herb sprigs inside. 2. Prepare smoker. Smoke chicken for 6-8 hours, or until the internal temperature reaches 180-185 degrees F. ( 85-90 degrees C.) This high temperature will make it easier to shred. 3. Once cooked, remove chicken from smoker and set on a baking sheet. Allow to cool (about 15-20 minutes) before pulling apart. 4. While chicken is cooling, add 1 bottle of barbecue sauce with 1 teaspoon of hot sauce, and 1/4 cup of brown sugar into a large saucepan. Allow sauce to simmer on very low heat for 5-6 minutes, stirring occasionally. Remove from heat, cover saucepan and keep sauce warm until ready to use. 5. When the chicken has cooled, remove skin, and shred meat. Place shredded meat into a saucepan with barbecue sauce. Make sure the chicken is well coated with sauce before serving.